The Gonzales family, who live in Nogales, Sonora, Mexico, buy food, candy, nuts, snacks wholesale and repackage them for retail resale in their neighborhood. They also deliver water to homes and businesses. 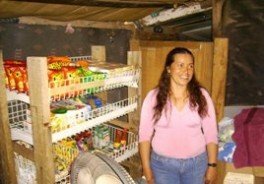 They borrowed 2,000 pesos (about US$165) from EnComun (a charitable micro-finance organization supported by ProMex Group) 1 year ago which as allowed their business to expand. They feel that the loan has been very helpful in improving the quality of their lives.